Happy New Year! As we start this new year, I would like to reflect on some of the major milestones for Sonoma County and the Winegrowers in 2012. The unprecedented launch of the joint Sonoma County brand with our Vintner and Tourism partners. Trip Advisor selects Sonoma County as the #1 Wine Destination in the U.S. and #2 in the world. 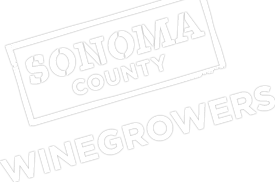 A year of successful events including Sonoma in the City (Los Angeles and Chicago), Sonoma Wine Country Weekend, Grape Camp and Sonoma Summit that educate consumers, media and trade about the world class wines made from Sonoma County grapes. One of the best harvests in Sonoma County history. Congratulations to all of you on a memorable 2012. Thank you for all of your hard work, dedication and passion for Sonoma County and the wine industry.